← Elephant Butte Lake State Park! Geri and Chuck (www.phunnyfarm.blogspot.com) offer to drive me around Truth or Consequences. We’ve just met and they both are enthusiastic about their newly-adopted town. I turn off the burner under the rice, lock up the Casita, and toss Bridget and Spike in the back of their car. Chuck climbs in with them, so I can sit in the front while Geri drives. It’s Friday and since the crew and I set up camp at Elephant Butte State Park Thursday afternoon, we haven’t seen any of T or C yet. Off we go! First we go to a rustic state campground (no utilities) with pretty sites under big trees along the Rio Grande. On the way to T or C, Chuck points out Turtleback Mountain, so named by the native Americans because it does look like there’s a turtle lying on top of the peak. In town Geri shows me two of her favorite restaurants, “Groovy Grits” and the “Happy Belly Deli” nextdoor. As you might guess from the restaurant names, T or C is not an ordinary town. Drop your pretenses and you won’t have any problem fitting in. Next we go to Geri and Chuck’s house and drink some delicious, iced, red-zinger sun-tea, while sitting in their outdoor room that overlooks the town and looks up to the mountains. Spike and Bridget meet their three canines and settle at our feet. Geri and Chuck tell me about their life together, their travelling in The Mothership, and their workcamping experiences, both good and not so good. It’s obvious they love their homebase in New Mexico. 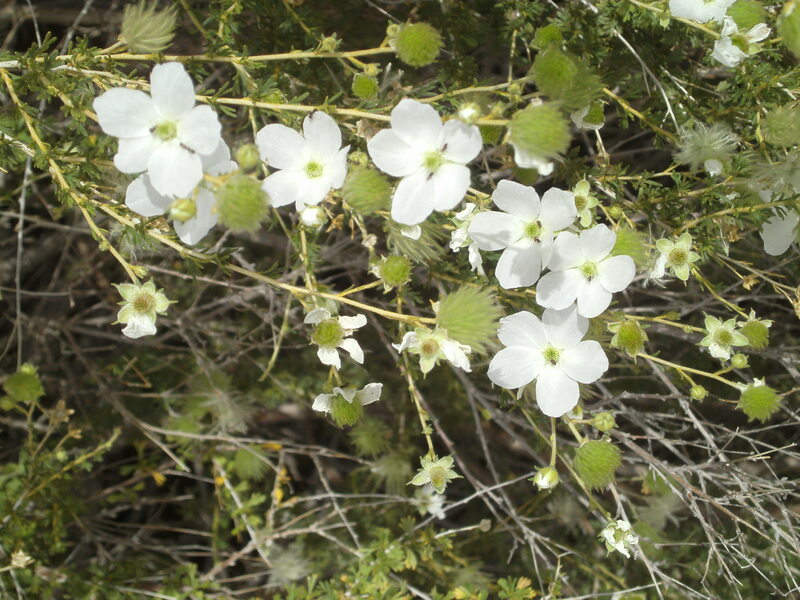 The variety of flowers in the desert seems endless. 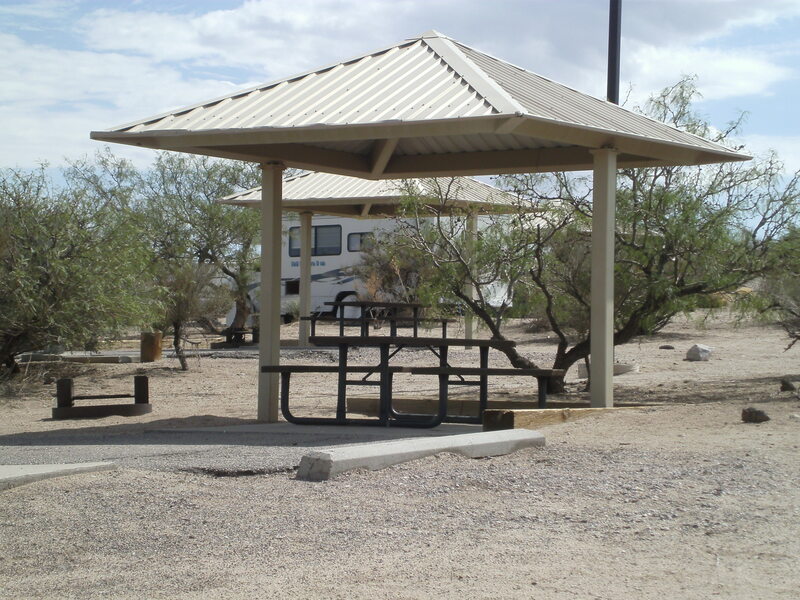 On the way back to the state park campground, we take a look at Cedar Cove RV Park, a clean, well-managed park in the town of Elephant Butte. Chuck dashes into the office and returns with a brochure. If I get tired of moving around and want to settle somewhere for a month or so (and have free WiFi and cable tv), I know a good place. As we’re driving out of the rv park, a roadrunner runs across . . . the road, what else! So I get to see my first roadrunner. Thanks, Chuck and Geri, for everything! Back at the state park campground . . . The weekend campers arrive, many equipped for some serious water sports. As I sit in my camp chair by our picnic table, reading my kindle, a brand new Class A with several slides tries to take the campsite next to ours. As its owner backs up from a site diagonally across, he drives one of his windows into the corner of the shelter! He takes a look and moves to another site on the other end of the campground. Later the white New Mexico pick-up drives in and rangers take photos of the shelter’s damage and the broken glass on the ground to include with the accident report. I meet a lady who travels in a Minnie Winnie. She’s walking her two gorgeous Australian Shepherds. We both laugh when I introduce Spike and Bridget . . . “Bridget? That’s MY name!” she exclaims. Of course, we talk dogs for a while. She tells me a bit about herself. Originally from Germany, she married a U.S. serviceman at age 22, had a child at age 23, and was widowed at age 24! They were stationed at Ft. McPherson, Georgia. Then she went back to Germany, earned her college degree, and taught chemistry in the U.S. for several years. Bridget (the lady) gives me the name of a local rv repair guy. She had to call him out to the park because the floor of her rv flooded. The problem? Her water heater had sprung a leak! I enjoy the activity outside my rear window. In the morning the quail are very active, scurrying about, going “yip, yip, yip,” here and there. A few moments ago a rabbit (normal kind, not a jackrabbit) hopped by. Last night after dark, a bird must have been drawn to the light in the Casita. It perched at the window and sang an insistent song right in my ear, like “hey, where’s my late night snack?” I couldn’t see it in the dark. Next post I’ll show you some photos of the lake! 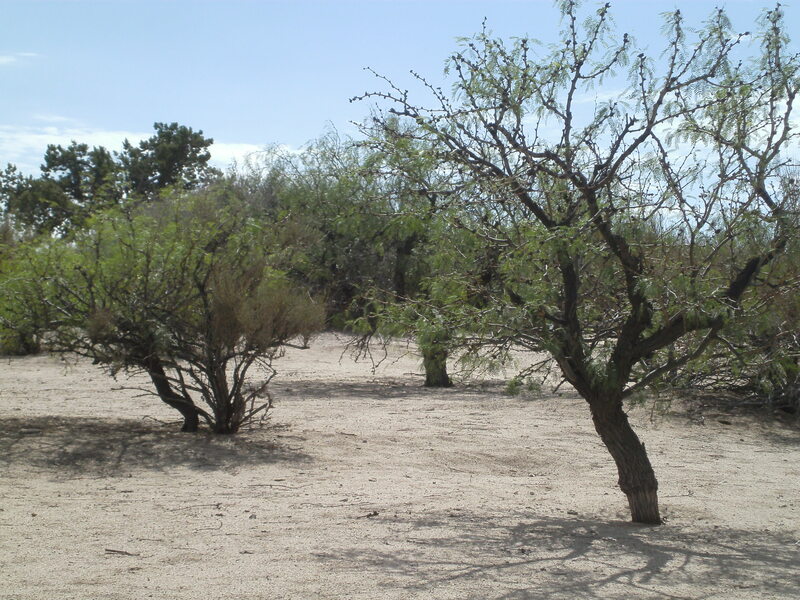 This entry was posted in Simple living and tagged campground, Elephant Butte, flowers, Minnie Winnie, New Mexico, rv park, RVing, Truth or Consequences. Bookmark the permalink. Ouch is right! I mushed a tree with my awning last spring trying to get into a tight campsite. 🙁 These things do happen, sorry to say. Hi, Judy . . .
I’ll be really upset when I do damage to my Casita. I hate the thought! Damage will happen! Chuck gave the MotherShip a new “personality” when he backed into a big rock while we were in Utah last May! I’ve never seen so many rv places . . . rentals, repair, storage, parks . . . It definitely is rv friendly. I’m enjoying NM very much. When you went to the office at Cedar Cove you were right in front of Mel. Sorry I didn’t know in advance we could have said hi. I didn’t know we were going there either. On the way back to the park, Geri said, “Let’s show her Cedar Cove.” So it was a spur-of-the-moment thing. I thought of you while we were there . . .
Been following your blog since you met the OFM Barney. I must say you have a wonderful interesting blog. Enjoying your travels. People say my blog is interesting and I really don’t know why, but I’m not about to argue. I’m enjoying my travels and I hope you do the same! None of mine or anyone else’s business I admit…but will ask anyway…..do you plan on spending all of your time in New Mexico? I’m going to try to spend the winter in southern New Mexico. In the spring I’m going to South Dakota to get a driver’s license. From there, who knows? I do see us returning to NM. Cool….we are SD ‘residents’ as well !!! We head to Rio Grande Valley for the winters….so we appreciate the need for warmer weather….. Ever since I picked up my Casita, I’ve hit the jackpot several times when it comes to meeting nice people. We really enjoyed showing you around! There is so much more to show you! We hope you won’t be a stranger…. remember how to get to our house??? You have our contact information on the card, we don’t have yours other than the blog! We would love to have you join us eating out at Groovy Grits one evening soon! We loved your very inspired description of Truth or Consequences! It was spot on! I was hoping you would approve of my description of T or C! I’ll get in touch . . . I’d love to join you and Chuck at Groovy Grits! Bring your new friend Bridgette along!